Why Do Sikhs Wear Turbans? The turban is a distinct aspect of Sikh identity, part of Sikhism's traditional attire and martial history. The turban has both practical and spiritual significance. During battle, the turban served as a flexible, breathable helmet protecting against arrows, bullets, maces, spears, and swords. It also kept a Sikh's long hair out of his eyes and away from an enemy's grasp. Modern proponents of the turban argue that it provides better protection than a motorcycle helmet. All Sikhs must follow a code of conduct, which includes the hair and head. A Sikh is expected to keep all hair intact and the head covered. The rule of dress for every Sikh man is to wear a turban. A Sikh woman may wear a turban or a traditional headscarf. A woman may also wear a scarf over a turban. Normally turbans are removed only in the most intimate circumstances, such as bathing the head or washing the hair. Sikhs must keep hair in its natural, unaltered state, known as kes. In addition to maintaining their hair, Sikh parents are to keep their children’s hair intact from birth onward. Covering long hair with a turban helps to protect it from becoming tangled or coming into contact with pollutants, such as tobacco smoke. Sikh code of conduct stipulates abstaining from using tobacco. When a Sikh becomes initiated as Khalsa, or "pure," amrit nectar is sprinkled on the kes, and Khalsa initiates consider the kes to be sacred thereafter. Confining the kes within the turban frees the wearer from the social pressures of fashion dictates and allows attention to focus inwardly on worshiping the divine rather than outwardly on superficiality. The kanga, a wooden comb, is used to detangle the kes, and oil is applied if desired. The kes is twisted into a joora, a knot or coil atop the head. The kanga helps to secure the joora and is kept with the hair at all times. The keski, a protective length of cloth, is used by some Sikhs to cover and twist the joora, binding the hair atop the head. Style and color may reflect association with a particular group of Sikhs, a personal religious conviction, or even fashion. Turbans are available in many different styles, fabrics, and colors. A longer turban is usually worn in a formal setting and may be color coordinated to the occasion. Popular traditional colors of religious significance are blue, black, white, and orange. Red is often worn for weddings. Patterned or tie-dyed turbans are worn sometimes simply for fun. A woman’s headscarf, or veil, is traditionally coordinated with whatever she is ​wearing and may be a solid color or contrasting colors. Many have decorative embroidery. What Is the Joora, the Bun of Hair Sikhs Wear Under Their Turbans? 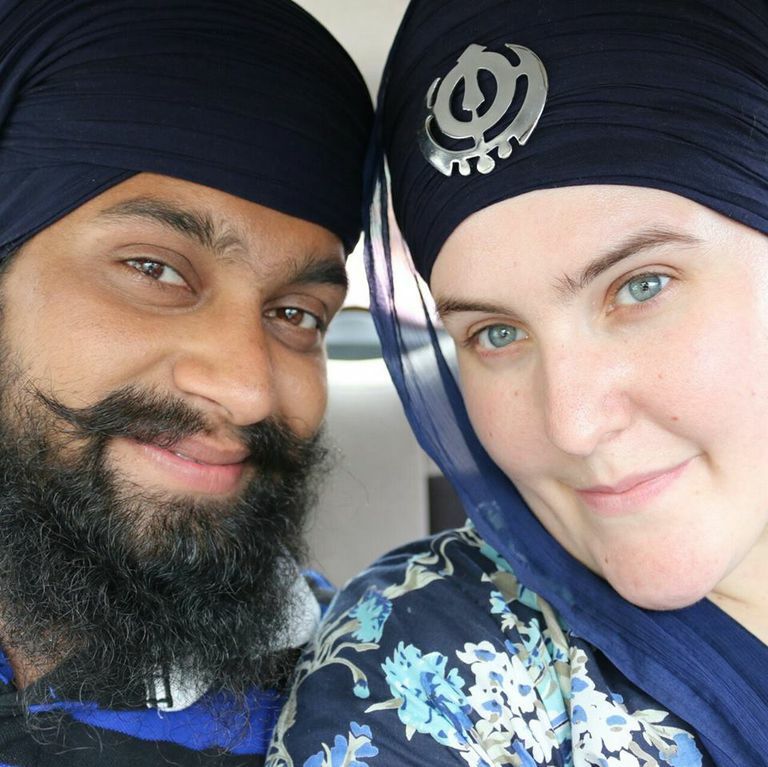 Why Do Some Sikh Women Have Facial Hair? Is Celebrating Christmas Holidays a Good Idea for Sikhs? What Are Important Do's and Don'ts of Sikh Weddings?